Heyo, 24-Hour Prize Pack Winners! Hey there, kids, sports fans, and readers! Is everyone recovering from the readathon last weekend? I know we promised this announcement sooner, but life (as it does) got in the way. But we’re here and I’ve got some winners to announce. So many of you completed a full 24 hours of reading and we are super impressed with some of you who even went a bit beyond that. But even more significantly, we welcomed 2,700 readers. TWO THOUSAND SEVEN HUNDRED readers. That’s 800 more than our previous record!!! We are utterly blown away by the enthusiasm for this little readathon and we were thrilled to read along with each and every one of you. 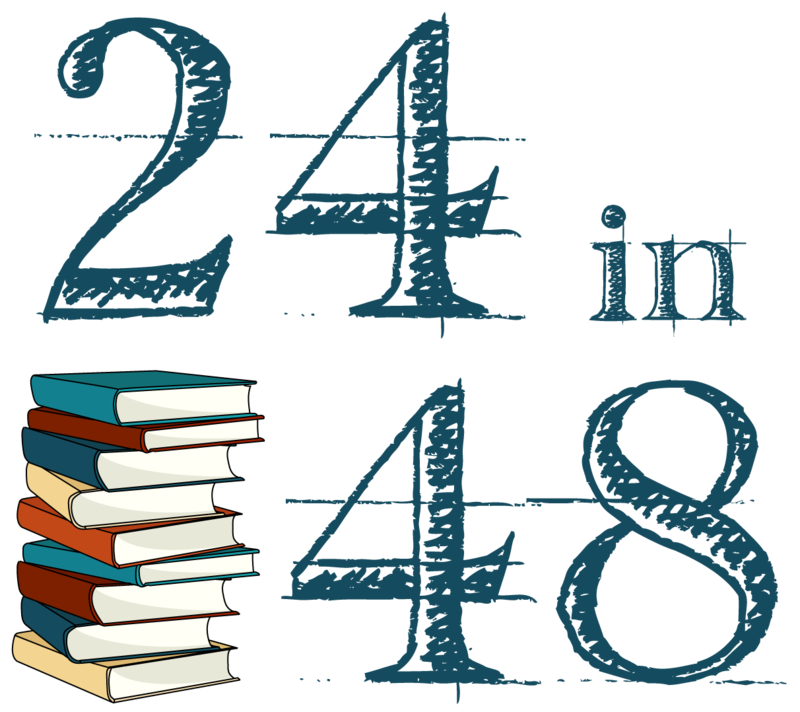 Thank you for making this edition of 24in48 such a resounding success. Winners, expect to see an email from 24in48 shortly and congratulations to all of you, whether you hit 24 hours or 2 hours, and we’ll see everyone back here in July! YOU DID IT!!!!! WE DID IT TOGETHER!!!! It’s officially the end of this #24in48 and whew boy, what a great readathon it was. You guys did amazing and so many (SO. MANY.) of you finished a full 24 hours of reading. And literally everyone read some fantastic books this weekend. I’m sure there was some stellar naps and snacks happening too (I know there were, I saw your social media posts). If you won here, go to the Prize Page and pick out your top three choices. Don’t forget to go check previous posts to see if you won a door prize or challenge task! Don’t forget to go add all the books you read during readathon to our tracker (and go check out Goodreads to see what your fellow readathon-ers were flipping through this weekend). Now we’d love to know how the readathon worked for you. We’d love to know what went well and what didn’t and how we might make it better. Your feedback helps us produce an event that’s as enjoyable for everyone as possible. Lastly, if you managed to read a full 24 hours, you’re eligible to win a prize pack (announced here), courtesy of some of our fantastic donors. Fill out the form below to provide proof of your full 24 hours read BEFORE midnight ET on Tuesday, January 29th. We’ll announce the winners of those packs next week. (Don’t forget that you must include a link directly to the proof post, not to your profile or to a story that will disappear). Once again, we are so thrilled you were able to join us this weekend and we hope you had an amazing couple of days full of great books, yummy snacks, and few interruptions. We’ll see you back here in July! Now we’re gonna go pass out for 12 hours. Guys, Day 1 of 24in48 is in the books! You’ve hit that mystical midway point, and by the official clock, it is midnight on Saturday night/Sunday morning. By now, you’re probably calculating how many hours you’ve read, how many you’ve got left to read on Day 2, and whether you’ll be able to go to sleep soon (psst, you totally can!). Hopefully you’ve gotten a ton of reading done and you can cruise tomorrow. Even if you haven’t and are trying to figure out how to squeeze 20 hours of reading in, do yourself a favor and prep for your Sunday reading time, kick your feet up, and ready the coffeemaker for the morning. No matter what Day 1 looked like for you, Kristen, Kerry, and I are all so impressed with you and think you’re absolutely killing it. If you won, make sure you go check out the prize page and enter your pick into the form. If you didn’t win here, don’t forget to go back to the posts from earlier today and check to see if you won a door prize or a challenge prize – you never know when your name might pop up! We’re pumped for Day 2 and I hope you are too. Now go get some sleep! Hour Zero: Welcome to the January ’19 #24in48 Readathon! It’s here! We made it! It’s time for another 24in48 readathon. If you’re joining us by the official clock, it’s 12:01am EST and we’ve got 48 glorious, book-filled hours ahead of us. If you’re joining us for the first time, welcome! We’re so happy to have you. To those of you who are chalking up another 24in48 on your tally board, we’re thrilled you’ve returned. As of right this minute, we’ve officially broken 2,500 readers for this ‘thon, which completely demolishes our previous record of just over 1,900. You’re all amazing and we can’t wait to get going! Your hosts (that’s me, Rachel, and Kristen and Kerry) have made a few changes (lookit that pretty new logo :insert heart eyes emoji:) for this readathon, but the basics are the same. The three of us will be posting throughout the weekend, here and all over social media. We’ll be taking turns on the official social handles — Twitter, Instagram, Facebook, and Litsy (@24in48) — and keeping track of the official hashtag #24in48. We’re bringing back book tracking from our last ‘thon in July where you can log all the books you’ve read during the whole readathon weekend. As you finish a book, enter it HERE and we’ll be adding those to Goodreads throughout the readathon. (Please be patient if you don’t see your books on Goodreads immediately; it’s a manual process for your hosts.) You can also check out your hosts’ TBRs and recommendations. Additionally, don’t forget about our PayPal Donate button to help cover the costs of international prizes, which allows us to include many more of your fellow global participants in the prize giving. We’ve gotten a few donations so far this year, but the more we get, the more prizes we can offer. Click on the button in the sidebar or go to this link to be taken to our donation page. 100% of your donations (minus PayPal’s fees) will go toward helping your fellow participants who are not US-based the chance to win prizes. As more donations come in throughout the weekend, we’ll add to the prize page so as many people as possible can win. Thank you to all of you that have already contributed. In July, we were able to offer dozens of prizes to international readers that we wouldn’t have been able to give away without your generosity. Plus! If you haven’t gotten your #24in48 merch yet, what are you waiting for? We’ve got tons of swag, including coffee mugs, t-shirts, hoodies, totes and more. Pick up your 24in48 stuff HERE or click on the baseball tee in the sidebar (it’s on sale throughout the weekend). All commissions we make go right back into to the running of the readathon, including helping us ship prizes out to you lovely readers. For more tips and instructions, check out our post on how to readathon and the FAQ page. Now, let’s kick this thing off with our intro survey. Introduce yourself by fill out the form below to be entered to win, then check out your fellow readers’ answers in the spreadsheet below. Winners will be announced at the midway point, Hour 24. January 2019 Prize Packs are Here! We’re quickly approaching this weekend’s #24in48 readathon and your cohosts are furiously making last minute preparations. But we wanted to take the opportunity to tell you about the prize packs you’re eligible to win if you complete a full 24 hours of reading. These packs are only possible because of the generosity of our donors and we’re so excited to be able to offer some really great options this year. You’ll have until midnight ET on January 29th to submit this proof, after which the form will be closed. Obviously, your proof is on the honor system and, while we’re thrilled to be able to offer these prize packages, please don’t abuse it. But you can’t win if you don’t sign up! So scurry over and get on that, people! And we’ll see you right back here for readathon-ing this weekend. It’s been just over a week since we wrapped up the July 24in48 readathon, and we’re still all heart-eyes emoji over the incredible weekend you guys took part in and helped to make wonderful. We topped out with just over 1,900 readers, making this our most successful readathon to date (and summer ‘thons are notoriously less popular). We also started tracking the books you guys read during the readathon; you logged 2,476 books and 1,887 unique titles. Readers came from literally all over the world: we had participants from 6 continents (and now my goal is to find a reader in Antarctica to participate), with nearly 78% in North America. And nearly 44% of you were first-timers! We got (almost) nothing but positive feedback on our push for diversity and we thank you for supporting this effort. Of the books you logged, 30% were by authors of color and more than 60% were by women. We still have work to do though; for more than 60% of logged books, participants noted that they weren’t sure about the author’s race, sexuality, neurodiversity, or disability status. That’s all to say thanks for making this most recent readathon a resounding success. Winners, expect an email from us shortly! Congrats and great job everyone, whether you finished a full 24 hours or just two and we’ll see you all back here in January. Hour 48: That’s a Wrap! YOU GUYS! You did it! We’ve hit the end of another fantastic 24in48 readathon. I don’t know about you but we are thoroughly exhausted and full of books. Everyone gather round for a big ole group hug. Yes, even you in the back! Now we’d love to know how the readathon worked for you. We added a few new elements this time, including asking you to let us know what books you read and where you’re reading from, and we’d love to know what went well and what didn’t. Your feedback helps us produce an event that’s as enjoyable for everyone as possible. Lastly, if you managed to read a full 24 hours, you’re eligible to win a prize pack, courtesy of some of our fantastic donors. Fill out the form below to provide proof of your full 24 hours read BEFORE midnight ET on Tuesday, July 24th. We’ll announce the winners of those packs next week. Once again, we are so thrilled you were able to join us this weekend and we hope you had an amazing couple of days full of great books, yummy snacks, and few interruptions. We’ll see you back here in January!